Jethro brings his daughter Tzipporah and her two sons, Gershon and Eliezer, to his son-in-law Moses. Moses follows Jethro’s advice and appoints judges to help him lead the people. Israelites camp in front of Mount Sinai. At Sinai, the Israelites hear the Ten Commandments and make a covenant with God. Upon hearing the Covenant, the Israelites respond, “All that God has spoken we will do.” After three days of preparation, the Israelites encounter God at Mount Sinai. God gives the Ten Commandments aloud directly to the people. Frightened, Israelites asks Moses to serve as an intermediary between God and them. Moses tells the people not to be afraid. In our congregation, we read Torah every Saturday morning. By tradition we are taught that it is at this moment in the service that we are re-living the Mount Sinai experience from thousands of years ago. Of note, we learn from various rabbis that it was from Sinai that we are supposed to have not only a reading of the Torah; but an interpretation of Torah as well. Who, in the Sinai story do you suppose is the “Torah reader” and who is the “Torah interpreter”? Almost everyone responds that although they may not know who the “interpreter” is, the Torah “reader” must be God! And they would be wrong! Remember, the people said to Moses, “You speak to us, ‘they said to Moses,’ and we will obey; but let not God speak to us, lest we die” (Exodus 20:16). So here is what happened. God came down on Sinai in a thick cloud. There was thunder, lighting and smoke. Moses went up, something happened, then Moses went down and spoke to the people (Exodus 19:25), and then in the very next verse (20:1) God responded and “spoke all these words, saying: ‘I am the Eternal your God who brought you out….’” Let me suggest to you that based on these verses that Moses is our “Torah reader” and God is our “interpreter” of Torah. In fact, in Psalm 29:4 we read, The voice of the Lord is with power. The meaning of this verse is that when God interpreted the commandments at Sinai to the men, the women, the children, and to the gentiles, God did so according to each person’s “power” of comprehension. 1.According to this commentary, which do you think is more important: To hear the reading of the Torah or to hear the sermon that interprets the Torah in a way that you can understand? 2.Is it all right to have a different understanding of a Torah portion than the one the rabbi gave in his sermon? Should you tell the rabbi what you think? Do you think he can learn something from you? 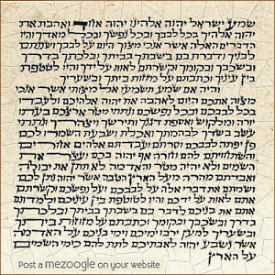 3.We talk about Torah being lashon haKodesh, “Holy language.” Does this commentary suggest that the Hebrew Torah might not be lashon haKodesh? Be able to justify your response. 4.Let’s put this another way: If our Torah is from Moses (It is the Five Books of Moses) and the interpretation of the Torah is from God (shiv’im panim l’Torah, “The Torah has 70 faces/facets” “There are 70 faces to the Torah: Turn it around and around, for everything is in it” (Bamidbar Rabba 13:15), then the most holy thing about the Torah is the interpretation, not what is literally written there. Defend Reform Judaism in light of this “interpretation.